This is why our professionals do all we can to make the fire damage restoration process as easy on the customer as possible. All you need to do is give us a call. We'll take care of the process from the initial inspection, through the insurance claim filing, and on to the completed restoration. With our Long Island remodeling contractors at your side, your home will function well and look fabulous once again. Let us help you get back to living without all this extra stress. When a fire destroys part or a major portion of your home, there will also be water damages to contend with. You'll also realize that the fire left behind a horrendous odor. All of this has to be properly dealt with to return the home to the original state. The first order of business will be an initial inspection for insurance purposes. The home will need to be boarded up where needed. Let us be your first call. If you have any questions, we will gladly help you with details. 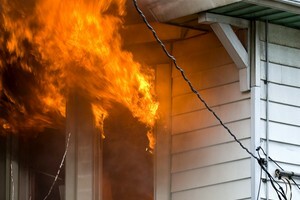 Why Choose Us For Fire Damage Restorations? As we have for many homeowners and business owners before you, we will restore your property with expertise. Your complete satisfaction is very important to us. Our contractors are excellent craftsmen. We have an entire team of experienced professionals who are skilled in all types of work including Long Island roofing, electrical, plumbing, siding, flooring, carpentry, masonry, and more. We manage your fire restoration project from start to finish. Give us a call today so we can get started. If you need help with Fire Damage Restorations in the Long Island area, please call 516-277-2300 or complete our online request form.